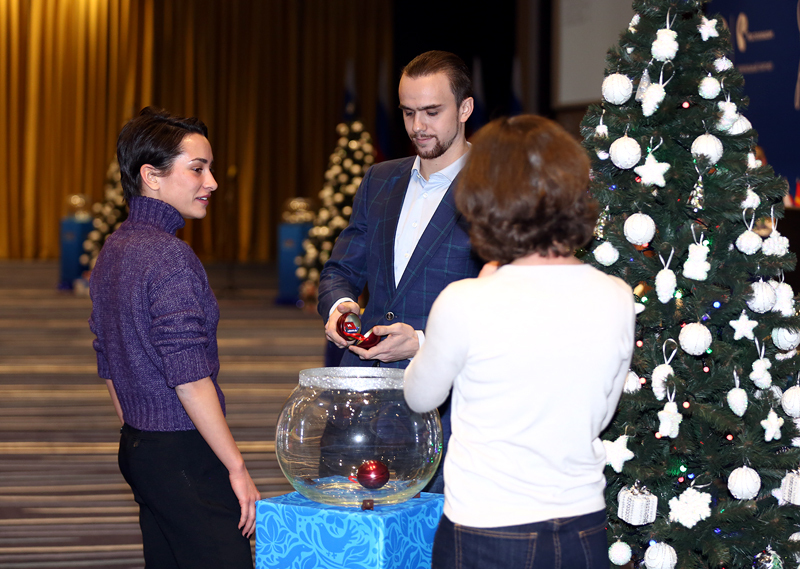 Interview with Ksenia Stolbova. About injury and recovery, music choices, programs and work with Yuri Smekalov. Ksenia, what prevented to start the season on time? – I remember exactly the date, when it all began, July, 17th. At the training camp in Sochi I was breaking in new boots, we worked on steps, programs, physical preparation, to be back in shape after rest. After returning to Moscow we planed to move to the jumps. But on the very first training session I tried to jump and did not work out. I thought, well, you never know, it happens. On the second, third day the situation has not changed, but the left leg hurt terribly. But I endured, what else could I do? Was skating through pain. We even did throws, tried to restore quad. We did everything except jumping. But when I took off skates, the foot began to swell, it became such a size that merged with the hip. With such leg I flied to the camp in Italy. Stayed there for a week, nothing was turning out, the pain didn’t go away. For two months I continued to train, but to be honest, everything that was happening shocked. We had to do something. We flew to Munich. Have done all the possible treatments, roentgenograms after which the German doctors said that I’m … okay. Can you imagine, the doctor said right into my face that everything is all right, coach Vlad Zhovnirsky was sitting next to me, but my leg still hurted and I did not feel my toes, I could do neither running nor jumping. I just could not stand it and left the room. At that point, did you have thoughts to quit? – After a trip to Germany, I did not want anything. I just could not torture our team, Fedor, myself, because I did not see a way out. My rehabilitator in Moscow said it was an inflammation of the periosteum, somewhere was pinched a nerve, which gave such a pain. The was one solution – to do the surgery, but the time was running out, the season started, it was necessary to start, so I refused to have surgery. Moreover, the surgery did not guarantee a full recovery. When I talked to the chief surgeon and traumatologist in Moscow, I was told that they will do an incision on the foot, after which will remain a scar. A small one, but the scar will be exactly on the spot of the shoe tongue, which will put pressure on it. The doctors said that the operation is jewelry, because all the joints are ok, the bones too, just a nerve pinched somewhere and hence such pain. How long will it take to recover no one could say. I understood, that if I agree to surgery, it means minus season. Therefore, it was decided to go to America to Jorge. Why you haven’t done it before? Can you imagine?! I have already been in America for three weeks, and here are two more! And this is in the middle of the season! But Jorge called Nina Mikhailovna, explained everything. Nina Mikhailovna understood, when it concerns athlete’s health she’s ready for anything, she will do everything for her student. And Nina Mikhailovna agreed because she trusts Jorge, as we all do. I returned to Moscow and within two weeks began to work slowly in the gym. But there was one more occasion that pushed me and forced to look at many things differently. I am very proud of my mom. She suffered a very serious surgery. And here these two weeks, it was like a sign from above, because I needed them very much. One week I was with my mother in St. Petersburg, just in time of Moscow Grand Prix. And it’s probably motivated me, after all I’ve seen, how my mother recovered, I realized that my leg is nothing compared to what my mother suffered. Back in Moscow, I immediately joined in the work. Yes, the pain is not fully passed. But I hope that will be held. Only a week before the Championships I started to jump. I had a break of eight months. For eight months I haven’t jumped, so I can understand my body and leg that it hurts. As written in Dante’s “Divine Comedy”, it seems to me that during these months I went through all nine circles of hell. I told only a small part of all that has happened. Whether it is a leap year or something that God sent me, so I have to rethink things, because these three weeks that I was in America I just needed it. My body has rested. Over 18 years in the sport I has not such a long break. And I am thankful that we have gone through this and returned. What was the reason of the inflammation? Defective boots? – Before the trip to Jorge we flew to Canada to make me a normal boots, because all the boots that were given for the season probably were defective. The model on which I skate is no longer produced, and apparently there was not drawings or shapes kept. When we arrived at the factory and began to measure (I brought my old boots, in which I skated around four years ago, and those that they sent), it turned out that the distances near ankle are different. One boot was narrower on few centimeters. They made casts of my feet, made on them new boots, I got new blades and in these skates, made on special order, I skate now and I’m satisfied. How Fedor reacted to everything that happened? – Of course it’s hard. I can understand him. I know what it is. I was waiting for him when he broke his leg. All the time you are in limbo, you don’t know how is he, shall you write, you afraid to call, don’t want to bother with questions. While I was treated, I felt Fedor’s support. But I do not want to speak for him, let him tell how he survived these months. By myself I know that it is unrealistically difficult. So I am very grateful, that he waited for me. You work a lot on programs yourself. Look for music, choreographers, dancers, fashion designers. Is this important to you and why? – I have great respect for our coaches, but I understand that the coach is not be able to feel everything as an athlete. The athlete must understand himself and look for what he lacks, what kind of music he would like to skate. Because the coach sees mistakes, he can suggest something, but he doesn’t skate. Yes, we have a large number of professionals, choreographers, but for the time that we work together, it happens that they have lost sharpness of vision, and I always want our programs to differ with fresh ideas that no one has tried before. That’s why I try to find specialists, choreographers, dancers. It does not matter where this person came from: Bolshoi Theatre, some show or just a dancer from the street. You can search everywhere. This season we were lucky, I met Yuri Smekalov, also another choreographer helped. We have done a great job in this regard. How did you get an idea to work with Smekalov? – We did programs, then the whole thing with an injury, but at the same time I knew that we needed something to do. Work on arms, plastique … I started to search over the Internet a good choreographer of modern dance. Of course, it was easier to find among our people, you wouldn’t ask someone to come from America or Canada. As a result of the search I stumbled on video with Smekalov. And as it happens, when you feel it with your soul, I realized that we need to work with him. I told Nina Mikhailovna, she trusts me, she just said, “Contact, invite him.” I got in touch and invited him. Yura came to Sochi, began to choreograph and it was unreal. – Yura very thinly feels. He very thinly felt me. I explained him my idea, my vision of what I wanted, what I lack. He listened it all, thought and we started to choreograph arms. Usually I’m very meticulous person, if I don’t like something, I’ll sort out a hundred times and there I had nothing to complain about. I really liked everything. He just understood exactly what I wanted. Pair skating became more difficult, and many pairs rely on elements and do not pay as much time and attention to the choreography. – Excuse me, but this’s not athletes’ fault. We have a desperate situation with the rules, and willy-nilly some guys have to ignor the choreography and try to keep up with the music, perform ultra-c elements and the rest of their baggage. I do not justify, I’m saying as it is. Those are the rules. But if you want to win, you have to skate good and do ultra-c. I can say for myself, I’m ready for it. Once we have such rules, then you have to follow them. This season you have different programs, classics for the short any modern for the free program. How difficult was it to combine this styles? – Let’s start with the fact that next year is Olympics. This was the last season when we can experiment. Since we have never skated classics, we decided to take a chance and see how it will be, how we will look in it. We chose modern because it suits us. We really feel this style, people understand what we are doing. I’m not trying to elevate yourself, but not everyone risks to take something like this. We decided to continue, why not. I said that if we do something in the same style, it should be even stronger than last year. Of course now it is difficult to say. When we were working with Yuri, it was really cool. Now, after a while, everything looks not so “tasty”, but I’m sure that in time everything will be back. Why did you choose this music? – All my life I wanted to skate to “Moonlight” by Debussy. For the first time heard, or rather, saw advertising of Coco Chanel with Nicole Kidman. Remember, when she walks on the red carpet and this music playes? It was 2008 or 2009. Sometimes happens such an inspiration, when you hear the music and you can listen to it endlessly. “Moonlight” is perhaps one of the few pieces of music, which I do not get tired of, and I can listen again and again. At this point, it seems to me that to this music I can do everything because it expresses my dreams, it gives me energy, positiveness, confidence. The free program is quite different, it to the music by René Aubry. But the music at the end was taken from the shampoo commercials. – For the free program we have took a difficult theme, the ending didn’t turn out. We could not find a piece of music for the finale. And I love Diana Vishneva, I watched all her performances, I follow her work. And once I looked everything that is connected with Vishneva, saw an advertisement with her, I thought: let see how Diana appeared. And suddenly I heard the music and realized that this is what we need. Where did you get such theme for the free program? – The basic idea is depression, when people lose their meaning in life. What to do, how to live, what to strive for? I think every person has such thoughts sometimes. To some extent, this probably applies to us. After last tough season Fedor and I were in limbo. And then a new problem. I remember three of us: me, Fedor and Nikolai Morozov were sitting and thinking what to choose for the program. And somehow the idea was born. First, I’m going crazy, and Feodor is trying to get me out of this state. Then Fedka goes crazy, and I try to save him. Then we both go mad in the sense that we return to ourselves and this makes the sense of life. In fact, I was very afraid to take up this topic, recalling Katya and Dima (Bobrova – Soloviev), Their program about mad people. But at the end of the program they both go crazy, but we’re trying to save, help each other, bring to life. Perhaps this is what happened in reality, at this Championships we got back, even though we only had three weeks to prepare. This program has become a part of us, we seem to live in it. You know, I think that the fate of an athlete depends on the program and these programs actually rescues us. What this victory at Russian Nationals means for you? – A lot. To be honest, I have never felt so. I got new emotions, a real buzz from figure skating. I realized how much I want to skate, feel the adrenaline, to see the audience. I have not had emotions like at the Olympics. I think this is understandable, yet everyone saw what was going on in Sochi. After that it was difficult to find the motivation, that we had before the Games. Now I probably was born for the second time in skating. I came back, like with an empty suitcase, baggage. I want to forget what happened before, because you can’t live in the past, otherwise there is no future. Please ,please can i have D.Fernandez phone number? What is doctor Jorge’s last name? Where in US does he practice? Oh! Thanks, I was curious too! First of all, you are killing me with all these interviews of Ksenia and Fedor. Apparently the media has missed them even more than I have! Second, that interview title breaks my heart. She is such a tough girl and if she said it was nine circles of hell, then it must’ve been. I feel so bad for her. This makes their winning the national title even more special for me. I knew she was injured, but this is just…wow. I didn’t know it was so serious. I did not expect Ksenia to connect with “Moonlight” so easily. I didn’t think she would be gentle enough for it. But even fierce girls have their gentle sides, and I have to say she looks like a queen in that program. I love how she seems so happy while she skates it. I love how she pictures herself as Nicole Kidman. I am already starting a petition for a Moulin Rouge program for them hahaha. And by the way, am I the only one who thinks she looks like Demi Lovato? I don’t see her being tender in the short program. Rather gorgeous in her grace and majestic.